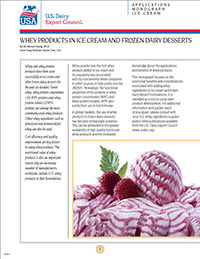 A 12-page monograph highlighting the functional benefits of whey in ice cream and related products, the manufacturing of frozen dairy desserts with whey ingredients, formulations with whey products and recommendations for the use of whey products in frozen dairy desserts. Also includes a Q&A section. Also available for free download in Chinese (Simplified) │Japanese │Korean.